Situated in the heart of Pembrokeshire in Wales, the ancient town of Pembroke has a vivid history stretching back to the 11th century. The main attraction in the town is the spectacular Pembroke Castle – a castle of Norman construction that dates from the 12th century. The mill pond surrounding the castle adds to the picturesqueness of the area and is a tourist attraction in its own right. Like most towns with a large historic castle, Pembroke attracts thousands of tourists every year. The pubs, restaurants, and cafes on Main Street offer places eat, drink, and refresh, but we can offer something even better – an out-of-the-ordinary culinary experience provided by fully-trained and experienced chefs. For Pembroke area residents and tourists should look no further than us. A hog roast is a traditional feast, one that makes you think of castles and kings. We have drawn on the traditions of the past and updated them so that you can enjoy an old-fashioned meal in the complete confidence that your food has been cooked to the strictest standards. Imagine sitting down to a meal of spit-roasted whole pig in the luxury of the grand hall of Pembroke Castle. Whilst it is not very likely that you would be allowed to take one of our machines into the castle, Pembroke residents can rent one of our machines and cook meat wherever they choose. Whether you live in Pembroke or are visiting the area as a tourist, we will be happy to arrange for any catering that you might need. The Pembrokeshire Coast National Park on the Pembroke Peninsula is close to the town itself and makes for a good day trip. In the local area there are trails that are great for walking, or riding horses on, and in many places dogs are allowed too. All of this makes for a fantastic holiday or weekend’s activities. And everyone knows that engaging in outdoor activities makes you hungrier than a horse. Luckily, our style of catering was designed for the hungriest of groups, because nothing beats hunger better than slow-cooked-to-perfection meats and side dishes. Chicken is a great alternative to pork, and we offer both chicken and turkey for smaller dinner parties, or for those who don’t eat pork. We can also cook beef on the spit (though obviously not a whole cow – our machines are big but they’re not that big) or if you prefer, spring lamb. Our side dishes range from the simple, including bread rolls and salads, to the more complex, like canapés. We can cook for the vegetarians in your group too – contact us to find out about the options on offer for Pembroke locals won’t want to miss out on. Part of Pembroke’s long and interesting history includes the historic dockyard area and the World War Two Martello tower. Pembroke is also a centre for the arts and approximately one hundred artists are based in and around the town. Visitors and locals alike can also make good use of the South Pembrokeshire Golf Club. We know that the best activities are those that are followed by a good meal. Whether you are planning a party, a wedding, an office function, or maybe even a family reunion, we have the catering skills and the tools you need to make a big impression on your guests. If you choose our catering option then one of our experienced hog roasters will come to you, bringing all the fresh ingredients needed to prepare a delicious and enticing meal. We can cater for informal gatherings or for more formal affairs. Our choices range from paper plates to full-service dinnerware, and we can cater for outdoor buffets or for sit-down meals. For hog roast hire Pembroke visitors and residents can turn to us for a great experience. 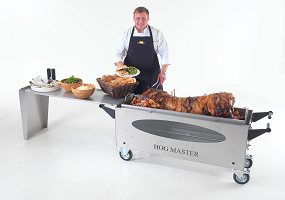 We will deliver the equipment and show you how to use it properly, meaning you can sit back and relax knowing that you have all the information you need to cook a beautiful hog roast yourself. Pembroke is a beautiful town with a unique history. Such a place needs a unique style of catering, and we know that’s why the people of Pembroke choose us to cater their functions. We have had great feedback from customers and we would love to help you cater your event too – feel free to contact us with any questions about our products and find out how we can help you to make your special day a day to really remember.